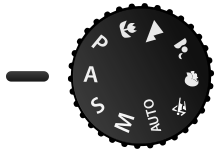 A Nikon style mode dial showing aperture priority mode. Aperture priority, often abbreviated A or Av (for aperture value) on a camera mode dial, is a setting on some cameras that allows the user to set a specific aperture value (f-number) while the camera selects a shutter speed to match it that will result in proper exposure based on the lighting conditions as measured by the camera's light meter. This is different from manual mode, where the user must decide both values, shutter priority where the user picks a shutter speed with the camera selecting an appropriate aperture, or program mode where the camera selects both. As an image's depth of field is inversely proportional to the size of the lens's aperture, aperture priority mode is often used to allow the photographer to control the focus of objects in the frame. Aperture priority is therefore useful in landscape photography, for example, where it may be desired that objects in foreground, middle distance, and background all be rendered crisply, while shutter speed is immaterial. To obtain this large depth of field, a narrow aperture (identified by a high f-number, e.g. f/16 or f/22) is necessary. Aperture priority mode also finds use in portrait photography, where a wide aperture (identified by a low number, e.g. f/1.4 or f/2.8) and therefore smaller depth of field may be desired to throw the background out of focus and make it less distracting. Another common use of aperture priority mode is to indirectly affect shutter speed for a desired effect. In landscape photography, a user might select a small aperture when photographing a waterfall, so that the camera will select a slow shutter speed (to allow a sufficient amount of light to reach the film or sensor for proper exposure), thereby causing the water to blur through the frame. When shooting a portrait in dim lighting, the photographer might choose to open the lens to its maximum aperture in hopes of getting enough light for a good exposure while maintaining the shortest possible shutter speed to reduce blur. ^ a b Gibson, Andrew S. (12 May 2012). "Aperture Priority and Shutter Priority: Exposure Lesson #1". Digital Photography School. Archived from the original on 18 July 2016. Retrieved 21 July 2016. ^ Hoffmann, Reed. "How to Shoot Blurry Water Photos". reedhoffmann.com. Archived from the original on 15 October 2013. Retrieved 22 July 2016.